Currently on display at the National Building Museum, Making Room: Housing for a Changing America, is a ten-month exhibit that aims to highlight innovative housing solutions in a one-of-a-kind, evolving installation. 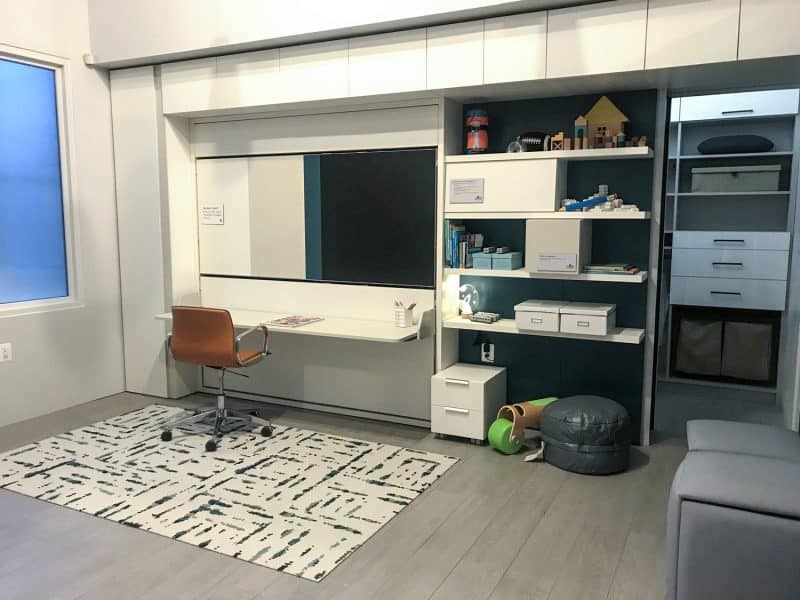 Organized by the museum and the Citizens Housing & Planning Council and presented in partnership with Resource Furniture and Clei, Making Room focuses on residential interior design, which is envisioned to meet the growing needs of America’s diverse households. Dovetailing with this mission, Ceramics of Italy is a proud sponsor along with in-kind support from its members, demonstrating why Italian tile is the best solution for 21st century housing. 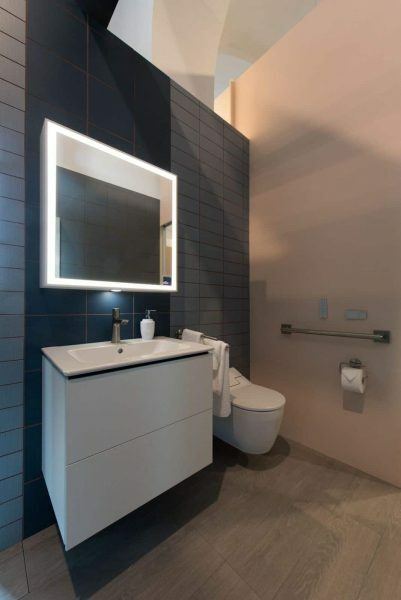 Bathroom 1 featuring Graph by Ceramica Vogue on the walls and Tr3nd by Ergon on the floors. After initially opening in November 2017, the exhibition centers around The Open House, a 1,000 square-foot, full-scale, flexible dwelling, which further illustrates how a small space can be adapted to meet many needs. Designed by Italian architect Pierluigi Colombo, the home comprises two distinct living spaces that could be used independently or combined to form a larger residence. On its own, the smallest space could be configured as a micro apartment. To highlight how the same space can accommodate three entirely different living arrangements – roommates, an extended family, and a retired couple with a live-in aid– the interior furnishings will be swapped out twice during the exhibition’s seven-month run. Transitioning from a roommate housing arrangement, the second phase of the exhibition was recently unveiled to showcase a home for an extended family including a child and grandparent. Bathroom 2 featuring Mat by Cir Ceramiche from Gruppo Romani on the walls and Apogeo by Tagina on the floors. Mirroring the modern yet tactile design Colombo has envisioned for the space, while demonstrating the latest designs and technical advancements, several collections from Ceramics of Italy were chosen to showcase the variety and versatility of Italian tile products. The refined and minimalistic Graph tiles from Ceramica Vogue are used in one of the bathrooms, while Gruppo Romani’s Cir MAT concrete-look collection adorns the walls of the second bath interior. 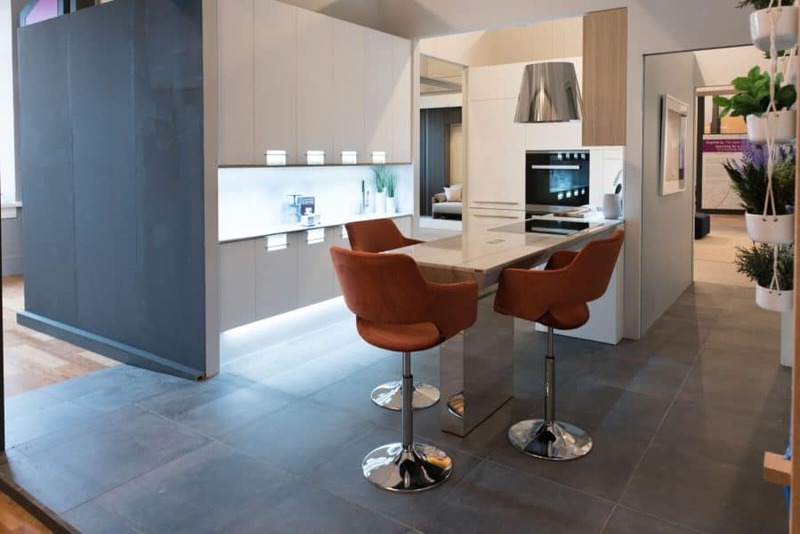 The floor tiles are set on a raised system by Newfloor with: Tr3nd by Ergon, a brand of Emilgroup; Tagina’s Apogeo collection and One by Ceramiche Caesar displaying tiles that demonstrate the impressive detail that experimental, modern technology can achieve on porcelain stoneware. 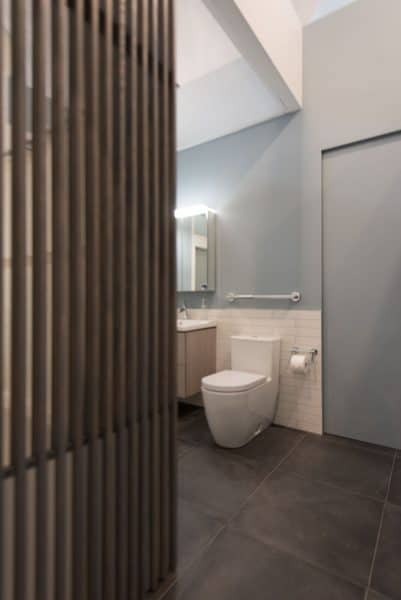 Tiles that mimic natural materials such as wood, anthracite and terracotta-cement designs are used with a range of detail and sizes that vary from 8×48” planks to 24×24” squares. Child’s bedroom featuring Tr3nd by Ergon on the floors. Bringing it all together, Mapei contributed mortars, grouts and sealants, as well as a surface preparation product to provide a complete solution for the installers of the exhibition. The tiles are set with Ultraflex 3, a premium thin-set mortar with a high content of a unique dry polymer, which acts as a superior adhesion between the substrate and tile. Mapei’s Keracolor U unsanded grout in Warm Gray and in Brick Red was chosen to complement the tiles. Ceramics of Italy is looking forward to sharing the unparalleled quality and timeless sophistication of Italian tile with architects, designers, builders and other members of the public in this rare exhibition running until September 16, 2018. In addition to the National Building Museum exhibition, each of these tile collections, among many others designed for flexible spaces, will be available from the respective companies at Coverings 2018 in Atlanta. Kitchen floor tiles from Tagina’s Apogeo collection. ​​​​​​​*All images by Carl Cox Photography/Courtesy Resource Furniture.